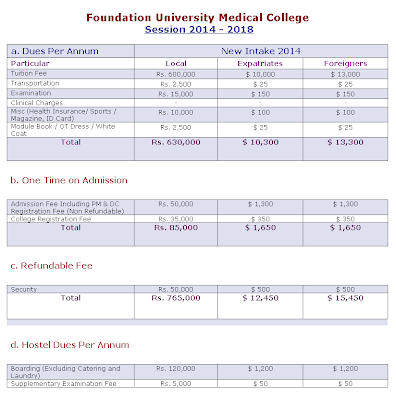 FUMC is offering MBBS and BDS for the admissions 2013-14. 2) Who can apply for admission in FUMC? The admissions in FUMC are open to all the candidates irrespective of the location. The admissions are offered totally on basis of merit. 3) What is eligibility criteria? Having atleast 60% in FSc or equivalent. Having atleast 24% aggregate in MCAT or atleast 550 marks in each of three subjects Biology, Chemistry and Physics in SAT-II. Those who did not appear in MCAT/SAT can apply on basis of the provincial entry test held by any province of Pakistan. Note: Last date to submit your SAT-II scores is 9th November 2013. Appeared in any provincial or federal entry test. 4) When will the admissions start? The admissions will start from 31st October 2013. Last date to apply for the admissions is 11th November. 5) What is the Selection procedure? 6) What is the distribution of seats in FUMC? 7) What is the fee structure? Attested photocopy of Federal/Provincial Govt. entry test result/roll no. slip of respective province. Attested Photocopy of Matric /Equivalent Certificate/Marks Sheet. Attested Photocopy of FSc/Equivalent Certificate/Marks Sheet. Attested Photocopy of NIC or Form “B” (if NIC not issued) . Certificate from Unit Commander in case of serving personals. Attested Photocopy of Pension Book in case of retired personals. Letter from Employers abroad for Parent/Guardian. SAT II / M CAT Examination result of candidate (if required). TOFEL/IELTS result of candidate (if required). 9) From where can I get the admission form? 10) What are number of seats for different provinces? The number of seats for the provinces is not fixed, the national seats will be allotted completely on the basis of merit irrespective of you domicile. 11) What were the closing merits of last year? my aggregate is 75.can i get admission here? have the admissions for FUMC closed? I have 865 marks in fsc and my aggregate is almost 77%.what are my chances of getting in FUMC?Do they conduct separate entrance test? If anyone has info regarding the above inquiries,then please help me out.